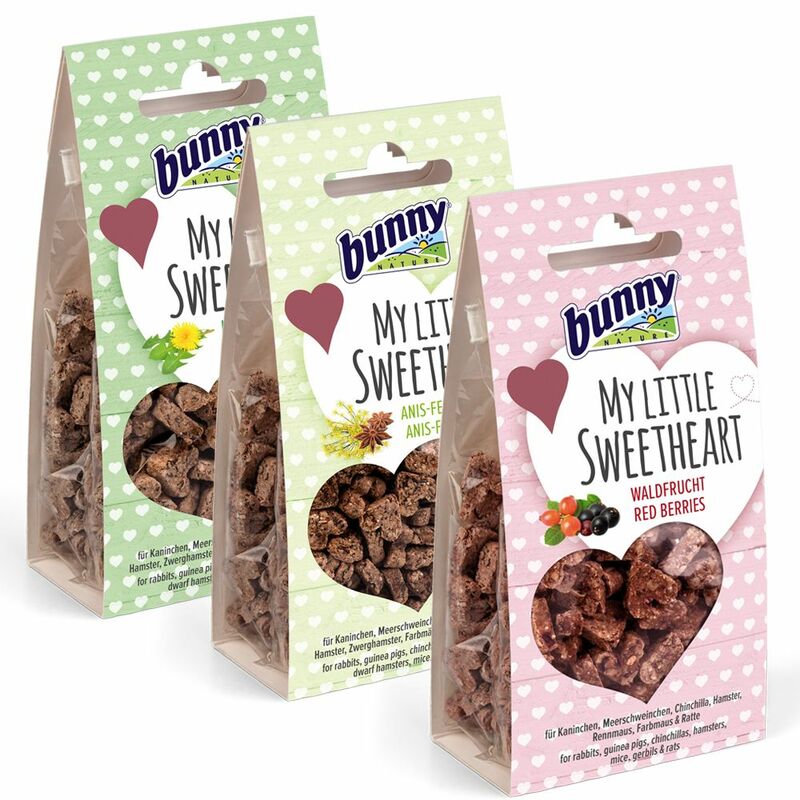 A heart for our little pets: The little yummy heart-shaped crackers are ideal for training thanks to their size. They are especially suitable for feeding small pets directly from your hand because of their size. This is why they are ideal for helping relatively shy animals to become accustomed to being stroked. The snacks are free from added sugar, preservatives and colours. The cute heart-shaped crackers not only look tasty, they also are very healthy. The inulin in the snacks regulates blood sugar to a healthy level. My little Sweetheart - Dandelion 30g: So cute... this adorable dandelion biscuit! A great taste explosion for our little darlings too! Perfect for a little snack or ideal as a reward. My little Sweetheart - Aniseed and Fennel 30g: What a fantastic taste combination: Aniseed and fennel! A snack that is very popular for everyone and will be gobbled up on the spot. A big treat as a reward or snack for between meals! My little Sweetheart - Forest Fruits 30g: A real treat! A varied mixture of valuable forest fruits with a unique flavour. Snacks for in between have never tasted better. These delicious snacks make a great supplementary feed for rabbits, guinea pigs, chinchillas, hamsters, pet mice, gerbils and rats. Bunny My Little Sweetheart Mixed Pack at a glance: Supplementary feed for rabbits, guinea pigs, chinchillas, hamsters, pet mice, gerbils and rats In 3 delicious flavour varieties: dandelion (30g), aniseed and fennel (30g) and forest fruits (30g) Heart-shaped crackers The size of the crackers makes them ideal for pet training For hand-feeding: to help pets get used to their owners With healthy inulin: to help regulate blood sugar No added sugar, colours or preservatives.